One of the interesting tidbits to come out of Microsoft's Surface Pro 4 launch was that the tablet features a 'hybrid liquid cooling' solution to keep the Intel Core processor and other critical components cool. 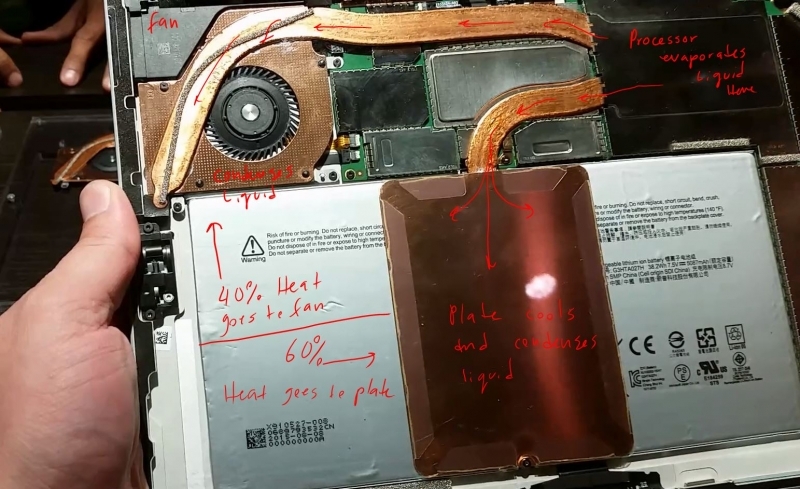 An image of the internals of the Surface Pro 4 has been posted to Imgur, exposing the hybrid liquid cooling system. Notes on the image from Sean Org, Senior Engineer at EMI Consulting, explain how this liquid cooling system works. The cooling system is essentially a thin vapor chamber designed to fit inside the Surface Pro 4's 8.4mm slim body. Heat from the CPU in the top right corner evaporates liquid in a chamber above the silicon, which then transfers heat to two heatsinks: one is a large plate over the battery, beneath the kickstand; and the other is accompanied by a fan in the top left corner. Both the large plate and the fan dissipate the heat in these areas, condensing the liquid that then returns to the processor. Crucially, the use of two heatsinks spreads the heat around the body of the Surface, reducing hotspots. The large plate over the battery also helps reduce the thermal load on the system fan, which means it won't need to spin up and create noise as often as in the Surface Pro 3. A similar hybrid liquid cooling solution will apparently be used in the Lumia 950 and Lumia 950 XL, although it'll be interesting to see how Microsoft will cram this type of cooler inside the much smaller body of a phone.